This new LP consists of a recording of album length material recorded in 1998-99 that was only previously released in an edition of 11 CD-Rs and given out by L’Hiver himself to those worthy of hearing the material. Consequently, for the past decade, the magnificent “Leichenstandard” album has been effectively lost. L’Hiver decided at last, however, to now give the recording the proper vinyl release that it deserves. Like other Winterblut material, this LP is, in L’Hiver’s characteristically atypical style, an excursion into the bleakest realms of the human psyche and soul. The six tracks contained here offer some of Winterblut’s most cold and hateful and also truly original tracks. Constructed from dissonant melodies and irregular rhythmic patterns, this album demonstrates the contorted style of Black Metal that is exclusively the province of Winterblut. 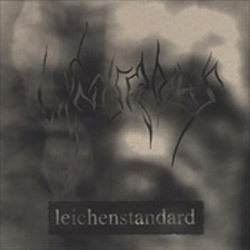 With this LP, “Leichenstandard” will finally have a formal release, however, because it is limited to just 250 copies, it may soon find itself sinking back once more into obscurity.